Peggy Nisbet Dolls - A Collector's Guide and illustrated listing - Nisbet "Homers"
"Homers" is a term we first heard from one of the past owners of the Peggy Nisbet brand. He explained it as a generic name for Nisbet doll bodies that had been dressed in a mixture of odd parts taken from genuine Nisbet costumes, to produce a doll that was a figment of the creator's imagination. The name "Homer" was derived from the source of most of these dolls - the vast army of Peggy Nisbet's Outworkers, (otherwise known as "Homeworkers"). Sometimes, there would be an extra doll body, or parts of costume, trimmings, or scraps of material left over from the completion of a batch of dolls. Homeworkers would place these aside, and very occasionally, a doll might be put together for a child or grandchild - or just to amuse the worker - and so another Homer was born! "Homers" can be very difficult to spot, because the doll and clothing is generally authentic. Unfortunately, we can't offer hard and fast rules for spotting these Faux Nisbets - you will have to learn them for yourselves. A good place to start is with your own dolls - they will most likely be genuine, especially if tagged, but a Homer lacks that indefinable something - that touch of Nisbet magic that makes them shine out as the real thing! The giveaway to their origin is, (like the Devil), in the detail! 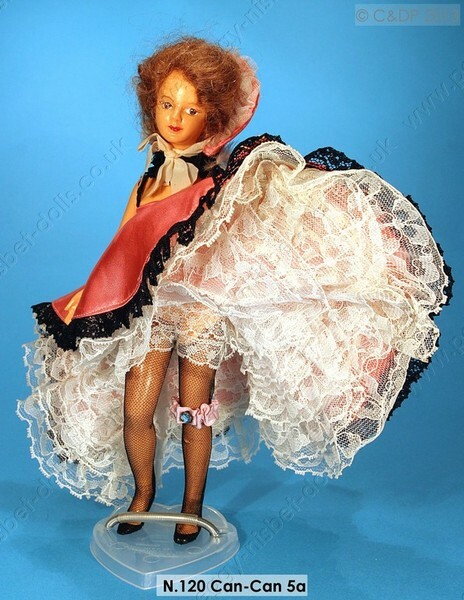 The skirts of the pink dolls are long, full, and underlined with lots of lace petticoats. By comparison, the dress of the blue doll is far too short for a Can-Can girl, and the lace petticoats are mean, by comparison. The bodice of both pink dolls is tailored to give a smooth and close fitting effect. The blue doll's bodice is poorly fitting, and wrinkled. 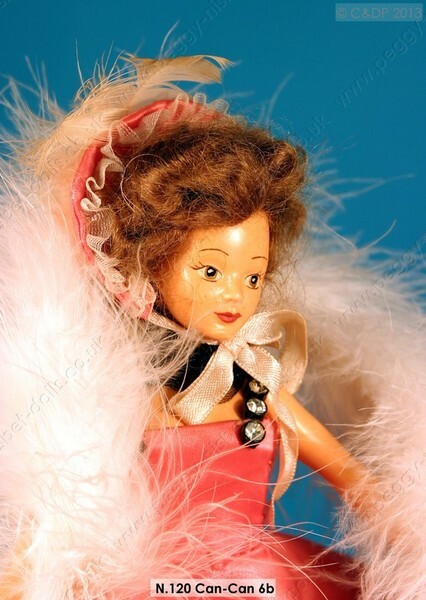 The pink dolls are dressed in a silky material - the blue doll is dressed in velvet - not the first choice for a dancer performing the energetic Can-Can! Finally, look at the headgear these dolls are wearing. The pink dancers have tiny feathered berets, tied under their chins. The blue doll is wearing a very large fur hat, which is totally unsuitable wear for such a vigorous dance as the Can-Can. When we obtained the blue dancer, we thought she was genuine - but as our knowledge grew, we realised she was much less than a Nisbet Can-Can dancer should be! Experience is a wonderful thing, and perhaps our mistakes explained will prevent you from following in our footsteps!